The metal engravings displayed in this section reflect the differences in style of four outstanding artists working in America in the late 18th and early 19th centuries. 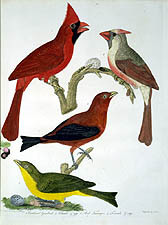 The same birds, blue jays in one part and cardinals in the other, are presented for comparison. Gould is represented by hummingbirds. 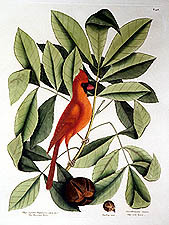 Mark Catesby's illustrations are somewhat stiff and posed, but have excellent botanical backgrounds. Alexander Wilson's portrayals are colorful and accurate, yet have a rigid, taxidermic character. 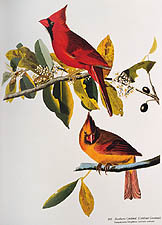 John James Audubon's birds are full of life and color, and are depicted in accurate natural settings.